Glaucoma comprises a group of diseases that damage the eye’s optic nerve and can result in vision loss and blindness. However, with early detection and treatment, you can often protect your eyes against serious vision loss. The optic nerve consists of more than 1 million nerve fibres that connect the retina to the brain. The retina is the light-sensitive tissue at the back of the eye. A healthy optic nerve is necessary for good vision. 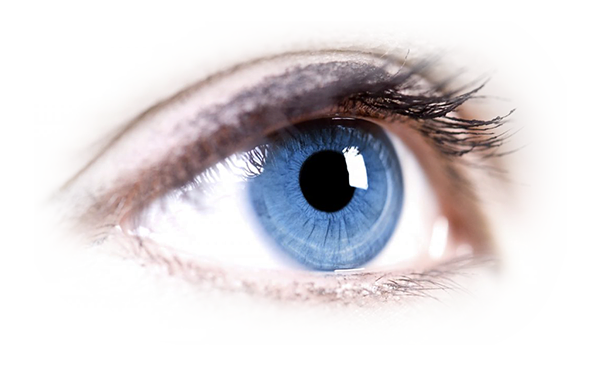 Several large studies have shown that eye pressure is a major risk factor for optic nerve damage. In the front of the eye is a space called the anterior chamber. A clear fluid flows continuously in and out of the chamber and nourishes nearby tissues. The fluid leaves the chamber at the open angle where the cornea and iris meet. When the fluid reaches the angle, it flows through a spongy meshwork, like a drain, and leaves the eye. In open-angle glaucoma, even though the drainage angle is “open”, the fluid passes too slowly through the meshwork drain. This leads to fluid and pressure builds up inside the eye causing damage to the optic nerve. When the optic nerve is damaged from increased pressure, open-angle glaucoma and vision loss may result. That’s why controlling pressure inside the eye is important. Another risk factor for optic nerve damage relates to blood pressure. Thus, it is important to also make sure that your blood pressure is at a proper level for your body by working with your medical doctor. Anyone can develop glaucoma. Some people, listed below, are at higher risk than others. African Individuals over age 40. A comprehensive dilated eye exam can reveal more risk factors, such as high eye pressure, the thinness of the cornea, and abnormal optic nerve anatomy. 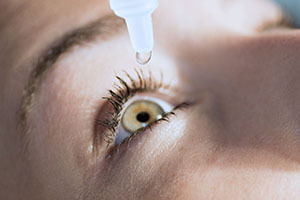 In some people with certain combinations of these high-risk factors, medicines in the form of eyedrops reduce the risk of developing glaucoma by about half. What special tests are done? This test measures your peripheral (side vision). It helps your eye care specialist tell if you have lost peripheral vision, a sign of glaucoma. In this exam, drops are placed in your eyes to widen, or dilate, the pupils. Your eye specialist then uses a special magnifying lens to examine your retina and optic nerve for signs of damage and other eye problems. After the exam, your close-up vision may remain blurred for several minutes. This is the measurement of pressure inside the eye by using an instrument called a tonometer. Numbing drops may be applied to your eye for this test. A tonometer measures pressure inside the eye to detect glaucoma. The calibre and distribution of the nerve fibres feeding to the eye nerves are evaluated with various types of optical scans (Optical Coherence Tomography). Glaucoma treatments include medicinal eye drops, laser therapy (trabeculoplasty), surgical implant/valve devices, conventional filtration surgery or a combination of these modalities. It is important to remember that although these treatments aim to preserve the remaining vision in the affected eye, they do not improve sight already lost from glaucoma. The eyedrops protect the normal remaining vision from any further deterioration. Medicines in the form of eye drops or pills are the most common forms of early treatment for glaucoma. Taken regularly, these eyedrops lower eye pressure. Some medicines cause the eye to make less fluid while others lower pressure by helping fluid drain from the eye. Before you begin glaucoma treatment, tell your eye care professional about other medicines and supplements that you are taking. Sometimes the drops can interfere with the way other medicines work. Glaucoma medicines need to be taken regularly as directed by your eye care professional, but some medicines can cause headaches or other side effects. For example, drops may cause stinging, burning, and redness in the eyes. 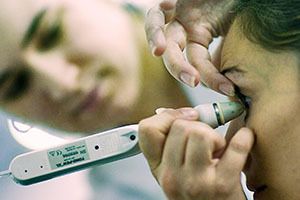 Many medicines are available to treat glaucoma. If you have problems with one medicine, tell your eye care professional. Treatment with a different dose or a new medicine may be possible. People may be tempted to stop or forget to take their medicine because glaucoma often has no symptoms. You need to use the drops or pills as long as they help control your eye pressure. Laser trabeculoplasty is a procedure that helps fluid drain out of the eye. The doctor may suggest this step at any time. In many cases, you will need to keep taking glaucoma medicines after this procedure. 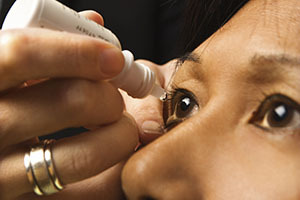 Before the surgery, numbing drops are applied to your eye. As you sit facing the laser machine, your doctor holds a special lens to your eye. A high-intensity beam of light is aimed through the lens and reflected onto the meshwork inside your eye. You may see flashes of bright green or red light. The laser makes several evenly spaced burns that stretch the drainage holes in the meshwork. This allows the fluid to drain better. Like any surgery, laser surgery can cause side effects, such as inflammation. The doctor may give you some drops to take home for any soreness or inflammation inside the eye. You will need to make several follow-up visits to have your eye pressure and eye monitored. If you have glaucoma in both eyes, usually only one eye will be treated at a time. Laser treatments for each eye will be scheduled several days to several weeks apart. Studies show that laser surgery can be very good at reducing the pressure in some patients, but its effects can wear off over time. The doctor may suggest further treatment. Surgical implants (iStent inject®, XEN gel implant®) are microscopic devices inserted into the drainage meshwork of the eye to expedite the drainage system. These procedures are performed in the operating theatre and multiple devices or valves can be inserted to reduce the eye pressure to the desired target level. This has proven to be a safe and highly effective surgical intervention for glaucoma. How should my eyedrops be used? With the other hand, pull down your lower eyelid which forms a pocket.